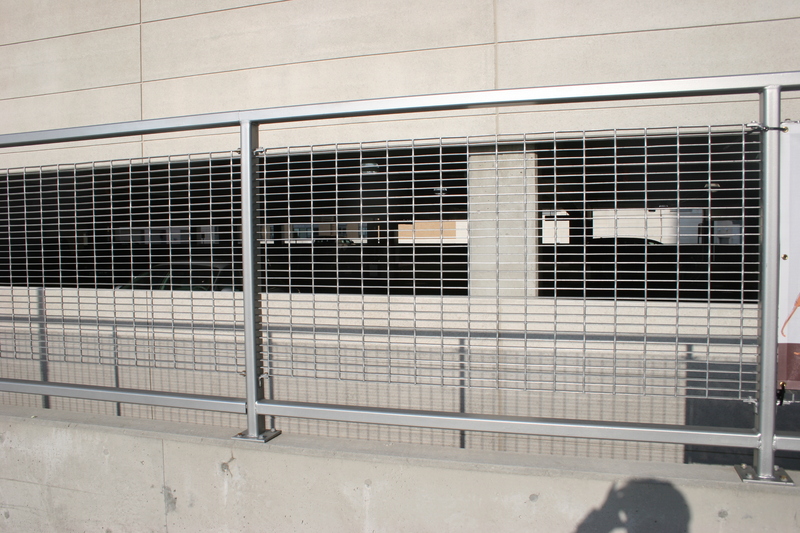 PalmSHIELD is excited about our aluminum and steel bar grating railing and fence panel systems. Bar grating is popular as a vertical infill material due to its real three dimensional appearance. With bars varying from 1” to 1 1/2” wide, it provides a great deal of depth. Bar Grating consists of a series of bearing bars welded or pressed at various intervals to perpendicular cross bars to form a load-bearing panel. Panels are manufactured by welding, locked by swaging, or press-locked processes. A typical panel configuration has bearing bars that are spaced 1-3/ 16 inches on center with perpendicular cross bars spaced 4 inches apart (center to center).Bar Grating is available in a wide selection of panel sizes; bar sizes and spacings; bar shapes; and material types. The most popular style is Welded Bar Grating. This bar grating material is an excellent infill for being code compliant. PalmSHIELD provides several CAD and PDF drawings for you to reference. With this information, engineers and architects will have an easier time providing a complete set of specifications for bar grating panel systems. PalmSHIELD has been successfully manufacturing aluminum and steel bar grating railing products for over 25 years. Our new bar grating system is a complement to our current array of louvered, perforated metal and square mesh systems. All of PalmSHIELD’s products utilize our proven picture frame system, Gorilla hinges, fully framed gates, engineered structural post design and internal locking device.